Dell Hits a 52-Week Low: Time to Power Down? Shares of Dell (NAS: DELL) hit a 52-week low yesterday after a lousy earnings report sent its momentum through the floor. Let's take a look at how the company got there to find out whether cloudy skies remain on the horizon. Dell hasn't had an easy go of it, as its latest earnings not only missed expectations, but they also came in well short of returns from the year-ago quarter. The company's trailing-12-month net income (before its latest stumble, anyway) is the highest it's been in half a decade -- but still doesn't match up to the company's profit high water mark, set back in 2006. Playing second fiddle to Hewlett-Packard (NYS: HPQ) has taken its toll on investors, as has the global shift toward mobile computing, which Dell has treated as an afterthought. To counter these corporate headwinds, Dell's been trying to emulate IBM's (NYS: IBM) model, which is a proven success story of transition out of the moribund PC market. DELL Total Return Price data by YCharts. Source: Yahoo! Finance. *Calculated from 2010 annual earnings from June 2010. Although Dell's three-year growth looks impressive, it's recession-inflated -- its four-year annualized growth rate is just 9%. That's better than HP, whose trailing 12-month net income is its lowest take since 2005. IBM's been consistently growing its bottom line -- though not as fast as Apple -- and its stock price has roughly kept pace. Small wonder that Dell wants a piece of that action. Seagate shareholders were in a similar boat as the big PC makers until flooded factories turned a hard-drive shortage into a profit bonanza. Such scarcity couldn't have had a positive effect on Dell's bottom line, but it also can't be blamed for Dell's long mediocrity. Intel's survived and thrived by being the king of a very exclusive silicon hill, another strategy that Dell can't follow without completely undermining its corporate identity. There aren't a lot of easy answers for the PC manufacturer. Switching to services is no guarantee when many of its high-tech peers are already transitioning toward an all-access model of subscription-based software, services, and support. PCs are essentially a commodity. At least Dell's still profitable, but since it lacks the dividend all four of the other hardware players offer, there's little much to commend its long-term worth over its peers. Where does Dell go from here? It'll depend on whether Dell can out-IBM IBM, or at least present a reasonable facsimile at a reasonable price. The Motley Fool's CAPS community isn't keen on Dell's potential, giving it a middling two-star rating, with more than 1,600 Fools predicting long-term underperformance. Interested in tracking this stock as it continues on its path? Add Dell to your watchlist now for all the news we Fools can find, delivered to your inbox as it happens. If you're looking for winners in the next technology revolution, take a look at The Motley Fool's latest free report on how "The Future Is Made in America." At the time this article was published Fool contributor Alex Planes holds no financial position in any company mentioned here. Add him on Google+ or follow him on Twitter @TMFBiggles for more news and insights. 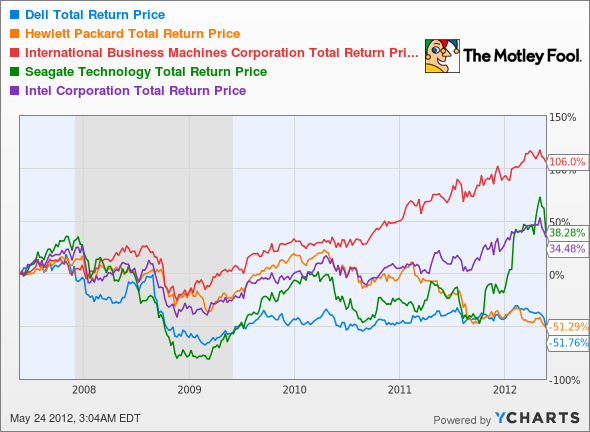 The Motley Fool owns shares of International Business Machines and Intel. Motley Fool newsletter services have recommended buying shares of Dell and Intel. The Motley Fool has a disclosure policy. We Fools may not all hold the same opinions, but we all believe that considering a diverse range of insights makes us better investors. Try any of our Foolish newsletter services free for 30 days.